The Financial Times has kindly printed my letter below, suggesting that President Trump’s focus on tax cuts is misplaced, given the headwinds created for spending and economic growth by today’s ageing US BabyBoomers. Sir, Gillian Tett provides an excellent analysis of the wishful thinking that seems to dominate US economic policy today (“Trump tested as hard economic data spell trouble”, April 21). The “sugar highs” she identifies in sentiment readings are probably as reliable as polling results in today’s febrile environment. The underlying cause of both phenomena goes back to 2001, when the oldest baby boomers began to leave the “wealth creator” 25-54 cohort that drives consumer spending. 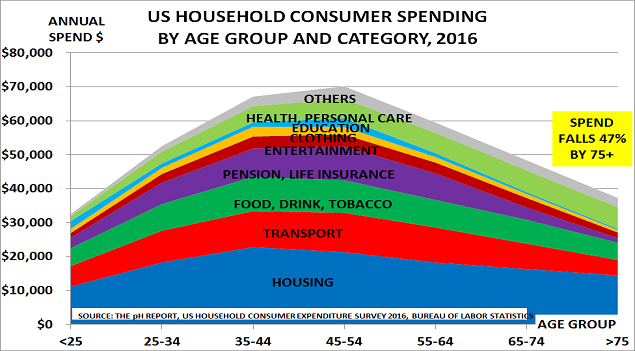 As the Bureau of Labor Statistics confirmed again last week in its annual Consumer Expenditure Survey, spending nearly halves by the age of 75 versus the wealth creators’ peak of $70,000. Consumer spending is more than two-thirds of the economy, and so the vast size of the boomer generation made it inevitable that growth would then start to slow. Unfortunately, policymakers failed to update their economic models to recognise the growing influence of demographics. Instead, they chose to assume that stimulus programmes, initially via the subprime experiment and then via quantitative easing, could replace this lost spending power. But they cannot print babies and the result has been a major increase in the debt burden, as growth and inflation failed to respond in the way predicted by their models. It is therefore disappointing that President Donald Trump is hoping to launch a third wave of stimulus, this time via tax cuts. Today is not 1986, when the average boomer was 31 and President Ronald Reagan’s cuts reinforced his “Morning in America” campaign theme. The average boomer is now 62, and the US urgently needs new models and policies to reflect this critical fact.